I was in Hawaii doing research for the shaka sign book and dropped by Ehukai Beach Park to check out the Pipeline Bodysurfing Classic. This is a rootsy, funky event with a great vibe. None of the glamour and hype of the big surf contests, but a ton of local soul, instead. Below are a few photos that I shot from beside the tree with a Lumix GH2 camera and Lumix 45–200 mm lens. 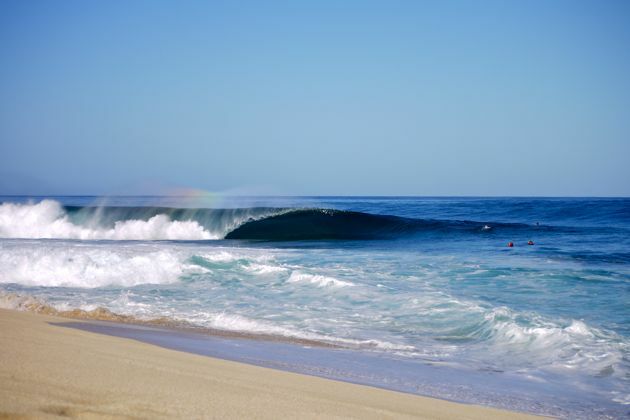 The Pipeline Bodysurfing Classic has run annually since 1971 at the world-renowned wave known as Pipeline, located just offshore from Ehukai Beach Park. The 2011 contest was won by Mike Stewart. (It was his 13th victory at the event.) For more information, including results from the 2011 contest, you can visit the event's website at pipelinebodysurf.com.